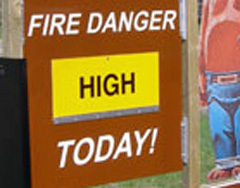 The National Weather Service has issued a “red flag warning” for fire danger in all of the western counties of Wisconsin from Superior to Prairie du Chien. Jim Bishop is public affairs officer for the Department of Natural Resources in Spooner. Bishop says even the area of northern Wisconsin from Antigo to the Upper Peninsula which got 7 to 10 inches of snow earlier this week is now very dry. He says it will probably be another 20 to 30 days before the completion of the “green-up” in northern Wisconsin. Bishop says his region has not had any major fires yet but DNR fire fighters have been busy with fires started by everything from exhaust pipes on ATVs to people improperly disposing of wood ash and embers from their fireplaces. The governor&apos;s fishing opener is this Saturday on the Chippewa Flowage.